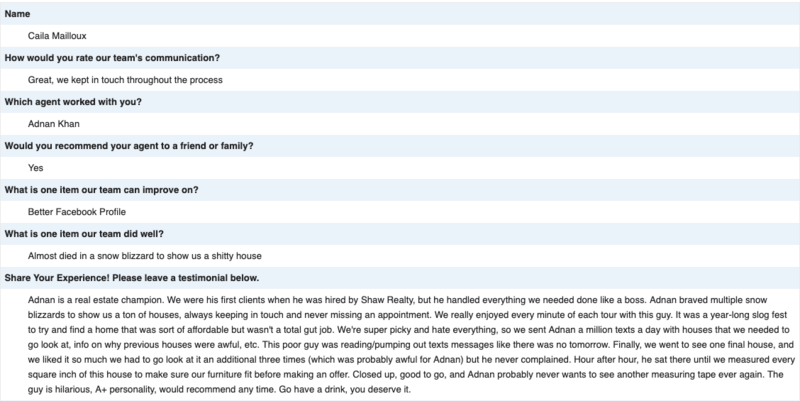 Shirzad was professional and polished in handling both the sale of my Condo and the purchase of my new home. He found exactly what I wanted. He is very detailed, yet quite patient. Shirzad, thank-you for all your help. It was a pleasure working with you and your team. Shaw Realty Group is next level in real estate. 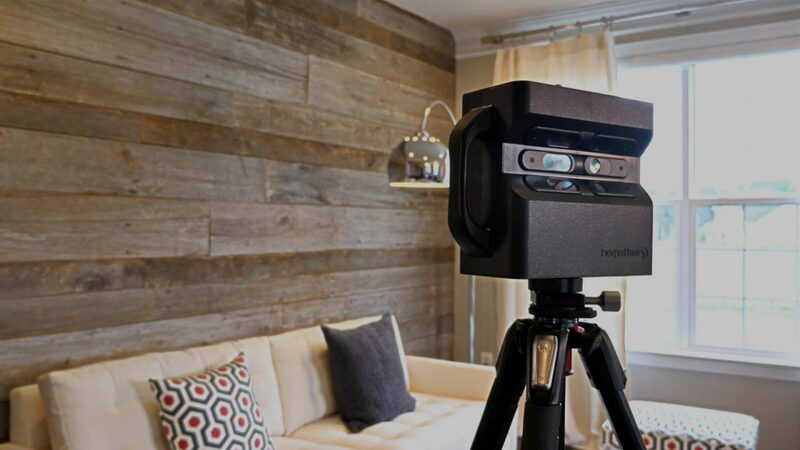 Using the newest technologies and marketing programs to sell your home and help you find your dream home are just a part of how they can help their clients. From referrals to home inspectors, lawyers, financing, to contractors so you can build out that dream kitchen – their friendly team have you covered. Mary Gagnier helped us find our first home this year. She was absolutely amazing, so patient as we looked at multiple places. She also spent a year and a half following up with me as I had mentioned I was renting but wasn’t in a position to buy yet. The brief follow up phone calls made to just ask how things were and if I still wanted to stay renting or start looking to buy made my decision to go with her as my agent very easy. She wasn’t over bearing or forceful with trying to get me to buy. Everything was so easy, I would reccomend Mary to anyone! Thank you again! Matt is not your everyday realtor who will tell you what you want to hear. First time we interviewed him for the sale of our home i went with another agent ‘big mistake’. My husband said to me ‘ thats the guy who will sell your house lol.’ Well we only had the house with the other agent for a few weeks and we called it quits and called Matt immediately. He has a strategy to cut the long story short. As a seller you want to see that your house is being marketed, you want reviews, you want to keep track of the showings, you want a plan B.. Does Matt give all of this.. Yes. He even took off time and his forever clean look to remove some dirt we had before closing since we are out of town. He is not just good looks he really has his A game on. Thank you Matt. Will i sale our house with Matt again?? YES & we will always use him. 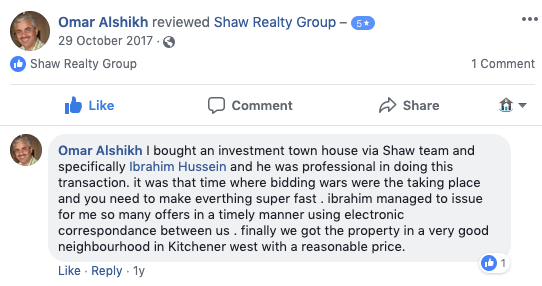 We used Shaw Realty for the sales of our home and Ibrahim was our realtor who went above and beyond to make this process smooth and bring us best value for the house. Ibrahim is a young and talented gentleman who makes the impossible possible. He is a go getter and will make sure the results are up to your expectations. We even used Ibrahim again for the purchase of our new home and very happy to use him again in the future and refer him to friends. Angela is simply the best! She has helped me buy two houses in the last year and I do not have enough good things to say about her. She traveled through snowstorms, was able to set-up viewings within hours (sometimes minutes!) of me reaching out and did everything in her power to find us the right house. Aside from her dedication and work ethic, what sets Angela apart is her trustworthiness. She gives her honest opinion and won’t let her clients settle for anything less than they deserve. I highly recommend Angela as a realtor and look forward to working with her in the future! Matt is a full time realtor, that doesnt mean 9-5. Matt was ready and available at all times it seemed. He always got back to us lightning quick and was extremely thorough and helpful. My wife and I were first time home buyers and he directed us through the whole process very effectively. Matt also tells it like it is, if he believes something is a good or bad deal he will let you know. He provides facts based evidence for why he believes things are a good/bad idea. At no point did it seem like he was trying to make a quick sale for us. He even had to tell us to slow down, we were trying to put offers on everything. Matt brought us back to Earth and convinced us to wait for something we truly loved. And within a few days he found exactly what we told him we were looking for. We are now the proud owners of a wonderful bungalow that we got for an incredible price. We couldnt have done this on our own. Matt works night and day for his clients, you’re getting a 24/7 realtor here, hes no weekender, this isnt his second job. This is what he does and he does it exceptionally well. They best group ever. We rate you Shaw and your team 10 out of 10! You get the job done right and on time. And great after sales service the best keep up the good work. Matt was professional, patient and knowledgeable. I’m sure I was a particularly tough client for Matt with my unusual schedule demands and the fact I was frequently coming in from out of town with very short notice wanting to see places. However Matt pulled through again and again with setting up viewings, getting information, coordinating with sellers and making time for me with no complaint. With him sending me constant updates on new places hitting the market and changes to existing ones I was able to assess a ton of locations that fit my budget and demands online. We also viewed about 15 together in person. Because of his skill in negotiating he helped me get a fantastic place in the heart of of my home town St. Catharines at an amazing price(lower than asking). I could not be happier. I recommend anyone looking to buy a home to straight to Matt. You will not be dissapointed! I just finished purchasing my very first home. I used Tyler Palubiski from Shaw Realty Group! Tyler was awesome, he was very professional in his approach and you could tell he did his homework on the listings he showed me. Within the first few listings, Tyler knew exactly what I wanted and didn’t want to waste my time on properties he knew wasn’t the right fit for me. I would highly recommend Tyler to my friends or family that are looking to purchase a home! He takes the time to get to know you and exactly what you are looking for! Thanks for all the help!! I look forward to working with him in the future! We used Keller Williams Niagara Realty, in particular Matt Guthrie to sell our home and purchase another. Matt was fast to respond to any issues that arose during the process and He was absolutely professional, but driven, and told us what we needed to hear, not what we wanted to hear. He got the job done in record time. Matt sold our home with minimal fuss. The listing for the home we wanted to purchase was pulled from the market, but Matt continued to follow up until we were permitted to make an offer to purchase, that home was secured for us. We moved in 3 weeks ago and are beyond happy. Matt has stayed in touch throughout and always made us feel like we were his most important clients. Matt did a fantastic job for us. I have referred him several times to friends and family and I will continue to encourage anyone I know who is buying or selling to talk to Matt first. He is on the ball, knows his business and how to make things happen. I would give him 10 stars if I could. Thank you so much Matt. We will always be grateful. Great team! I have hired them twice! My family, and I have nothing but amazing things to say about Matt. He came highly recommended to us from a friend, and now I see why. Matt goes that extra step in everything he does. He was available to answer any questions we had, he provided us with excellent resources when it came time for a mortgage, and finding a lawyer. Matt had found us the perfect house, and we were up against the odds with 3 other offers, but Matt closed the deal, and got us our dream house. He really does go above, and beyond. You can tell he loves what he does, and he’s great at it! Thanks Matt!! 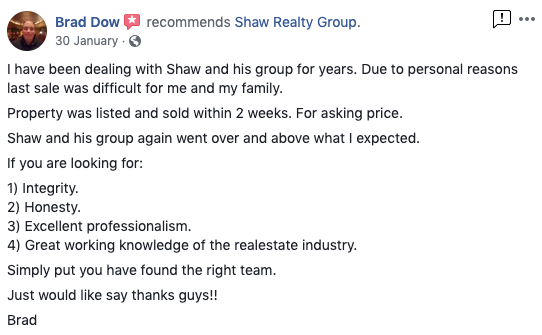 Great team to work with: the Shaw Realty Team went above and beyond to help us navigate the process of selling our home….highly recommend the Shaw Realty Team! 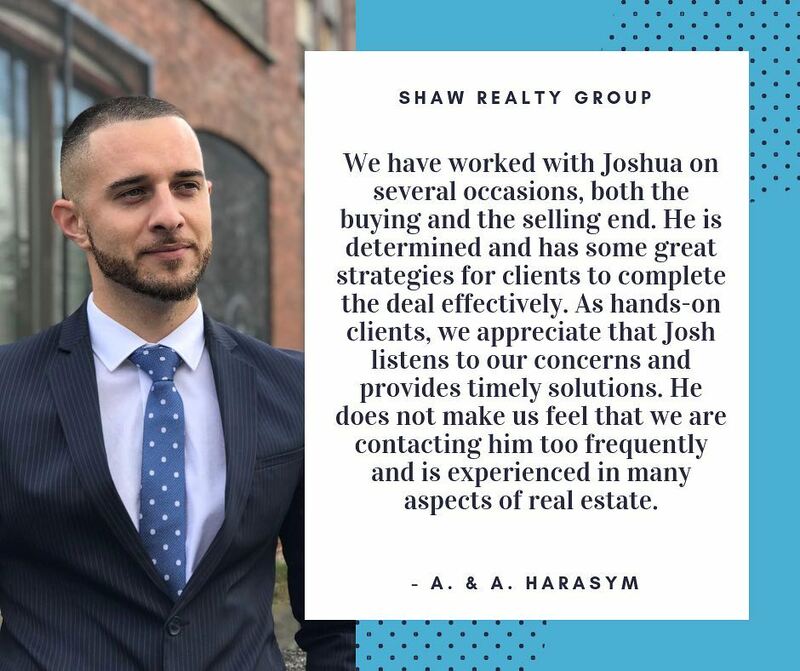 We had an excellent experience with the Shaw Realty Group. Our agent, Sam Abdallah, was very knowledgeable, patient and available. Thanks to his expertise we were able to find the perfect home for us in a difficult buyer’s market. We would recommend this realty group and Sam Abdallah to anyone and will continue to use them for our real estate needs. Thank you Shaw and Sam, we appreciate all you’ve done for us. My wife and I have nothing but good words to say about are realtor Matt. Since we have moved to a completely new city he took the extra step to find an appropriate school for our kids in the area. He gave us recomendations for a good gym and helped us get familiar with the new surroundings. Very friendly and trustworthy. He was available 24/7 and answered all our questions and concerns. And most importantly he found the house that met all our needs and that we both fell in love with. Wasn’t pushy with the sale, and truly cared about our best interest and that we get what we were looking for. Would recommend him to all of my friends and family! Shaw and his team sold my home for me while I was out the country. Initially I was worried about being far away, but it was quick, easy process that I would happily sign up for again. Matt Guthrie and his team are amazing agents. They sold out house for what We wanted I can’t be happier! I just finished the process of purchasing my first home, I had the privilege of working with Sam from Shaw Realty. I originally had a realtor that did not work out for me; they couldn’t book showings for places I wanted to see and rarely did they ever do anything to help me look for places either. It was a breath of fresh air to have a realtor that I felt was actually trying to help me. I also used a mortgage broker and lawyer referred to me specifically by Sam and had no issues at all with anyone. I am in my new home now and hope not to have to move for a long time, but if I do, I will be calling Sam. I was overly impressed by the professionalism and accommodating performance Matt exhibited throughout the sale of my home. He assured me that the sale would go well and when the house was sold in under a week for over asking price I was extatic. Amazing job Matt! I am now using him again for the purchase of a new home and he has been great throughout the process, again being accommodating around my busy work schedule and giving honest input on all the homes we have seen. Professional team that worked quickly and diligently to get us the home that we wanted. This was our first time working with Matt as we were looking to buy and sell and we couldn’t be happier with our experience with Guthrie Realty Team. During this time, Matt was responsive to our wants/needs and was helpful in sending potential properties our way. Matt worked hard to book us showings within a few days of our request (sometimes even same day) to accommodate our schedule and was always available. Our favourite quality about having Matt as our realtor was his ability and desire to give you his honest opinion about the property. Having Matt point out potential repairs/upgrades was exactly what we needed. It allowed us to take a step back from all the things we liked and make realistic decisions since we weren’t savvy to home repairs. 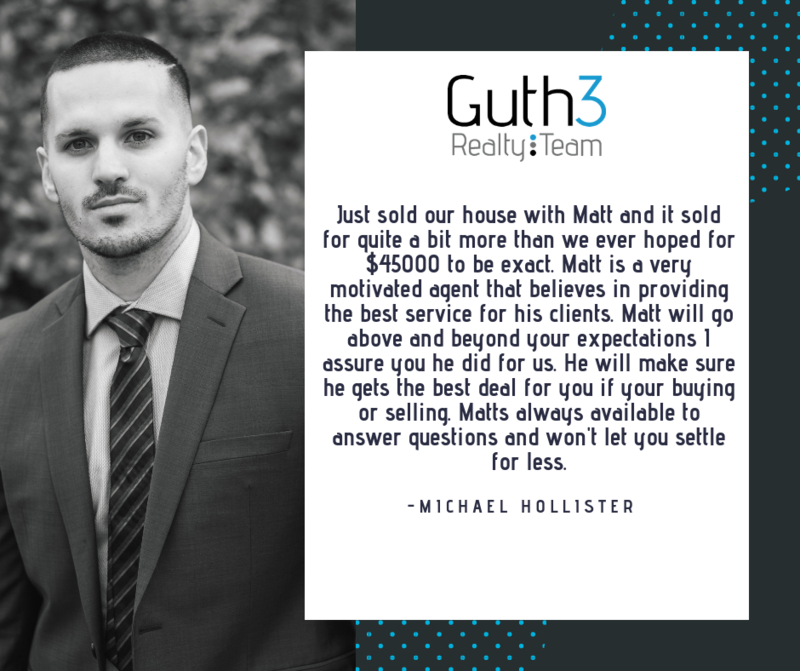 If you are looking for a realtor that will put in the time, get things done and isn’t just looking to make a sale than Matt’s the one for you. Thank you Matt, because of you we are settling into our new home that we absolutely love with zero regrets. We had a positive experience with Shaw. Our agent, Ibrahim, worked hard to make sure that we got the right house for the right price. We’re very happy with our house and with our service from Shaw. Just sold our house with Matt and it sold for quite a bit more than we ever hoped for $45000 to be exact. Matt is a very motivated agent that believes in providing the best service for his clients. Matt will go above and beyond your expectations I assure you he did for us. He will make sure he gets the best deal for you if your buying or selling. Matts always available to answer questions and won’t let you settle for less. We have had a wonderful experience dealing with Shaw, and his team on the purchase of our new home and on the sale of our home. Shaw was professional, knowledgeable and very quick to respond to any & all questions that we had throughout the process. It was great working with such great people and having such wonderful results with Shaw! Hi everyone, I just wanted to tell you guys about my experience buying a house. Me and my wife are new to the Niagara region and just started a family. With the new addition in our lives we decided it was time to stop renting and plant some roots. We are first time home buyers and had no clue how any of the process worked. We found Doug McKee online and boy are we glad we did. Doug from the very start was so helpful. He took his time to explain how everything works and never got annoyed by my endless questions. When we started looking at houses Doug was very patient and never rushed us. Doug pointed out things in house we would have never noticed or even considered. He was not looking for a quick sale with us but wanted us to be happy. When we found the house we loved, Doug got it for us well below asking price. Two days before we were ready to take ownership of the house the furnace broke. I was ready to take $1000 dollars for repairs and then Doug stepped in and got me double that! I highly recommend anyone buying a house that is looking to have a fun time doing it with a honest guy that will look out for your interests to give Doug McKee a call. You wont regret it. You know buying a house is a big investment. I have bought 5 (I move with my husband’s job, and my love to re-decorate then make money!). So I know a little about getting the right agent. 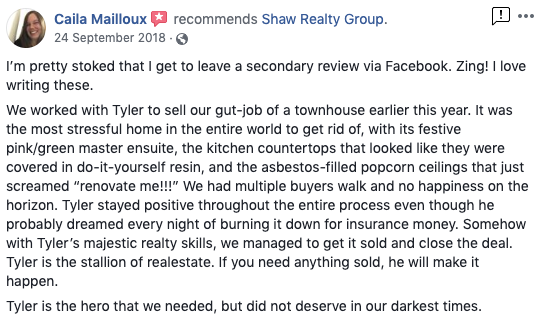 Tyler at Shaw Realty Group was patient and informative. He was willing to take me to any house I felt I wanted to view. By listening to us he finally found us just the right house. Since it was a bank sale, he helped us through the process of making sure we didn’t pay too much and reserved the money for costly repairs. Once the negotiations cleared he sold our home in just 2 weeks with an early possession date. Overall I have to say his strongest quality as an agent is his patience and persistence. Great Job Tyler! We recently had the pleasure of working with Matt to sell our home and purchase a new one. His marketing is second to none. We had over 70,000 views of our home via social media, MLS, Matt’s unique 3D tour and Google advertisements. We were very impressed with his out of region marketing as well to areas like Hamilton and the GTA. Our home was sold within 2 weeks of being on the market for 98% of the asking price. I have referred Matt to my family and he sold their home for over asking price within a week. He really goes above and beyond for his clients; answering texts and phone calls at all hours of the day. His business really is open 24/7 to meet his clients’ needs. 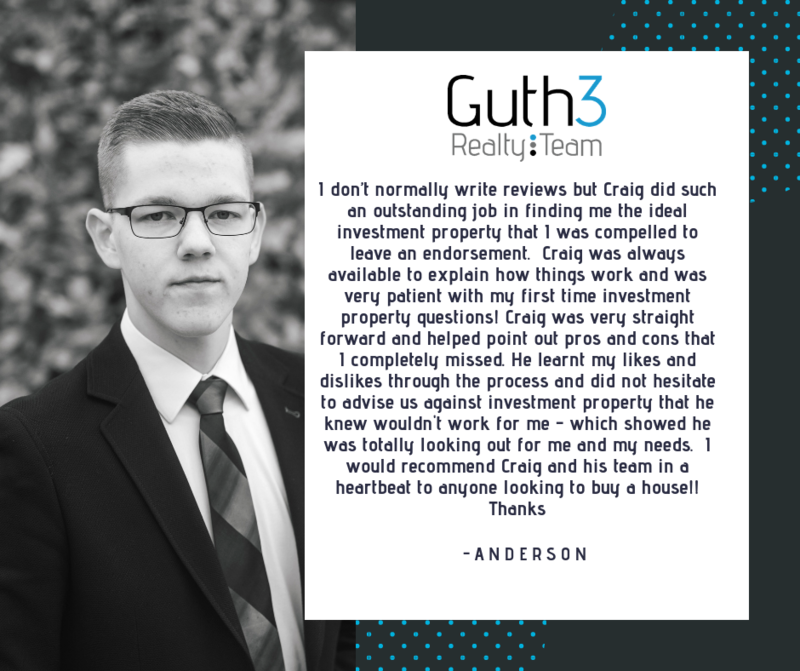 When we sell again, you can bet there will be a Guth3 sign on our lawn! I have been dealing with Shaw and his group for years. Due to personal reasons last sale was difficult for me and my family. Property was listed and sold within 2 weeks. For asking price. Shaw and his group again went over and above what I expected. 4) Great working knowledge of the realestate industry. Simply put you have found the right team. Just would like say thanks guys!! Matt has gone above and beyond to make sure I got a house that was perfect for me. He wasn’t just trying to sell me anything that popped up on the market; he understood what I was looking for and took the time to find me something tailored to my personal desires while being honest and upfront about everything. He’s dedicated enough to work around the clock, making personal sacrifices for his business. 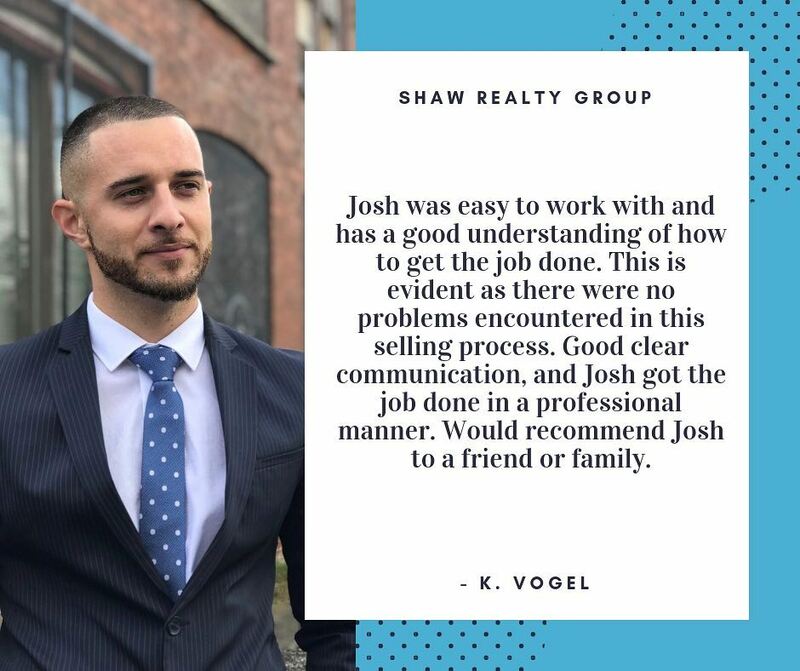 I couldn’t have asked for a more clear-minded, devoted realtor and will be definitely be recommending him to anyone I can! Thanks Matt! Thank you Sam Abdallah for going above and beyond and helping us purchase a home and selling our home. Thanks again for all of your time, your kindness, and your knowledge!! You were wonderful to work with–we really got blessed! I purchased my very first home with the help of Matt. We looked at a total of 6 homes before I found the one I was looking for. Matt knew what I was looking for before I did and strongly encouraged that I take a look at the house I ended up purchasing. He was very attentive and quick to respond to any questions or concerns that I had as a nervous first time home buyer. I would recommend Matt to anyone looking to buy or sell! I will 100% be using Matt again in the future when the time comes. Thank you Matt for all of your hard work! Working with Shaw and his team was a great experience. They provided the insight we were looking for and were available whenever we needed them. I would definitely recommend the Shaw team to anyone looking for real estate in their area. My father, brother and I have purchased our first investment property through Matt Guthrie. He was experienced, knowledgeable and well informed and took the time to show us numerous properties. We are out-of-town investors and Matt eased the burden by helping us find tenants and was also our go to person when looking for home improvement contacts. He has exceeded our expectations and we will most definitely be using Matt again for future endeavours. I highly recommend him to anyone purchasing real estate. A couple years ago we were looking to sell a property quickly. We contacted Shaw who assured us it was as good as done. He sold the house within a week at an agreeable price. Shaw Realty Group is a highly professional, efficient team and I cannot recommend them highly enough. You want your house sold … call Matt. You looking for one to buy and are tired of missing out in this sellers market? call Matt. We were thrilled with the speed in which we both purchased and sold our homes. Matt is second to none in the realty business. He is young (and therefore knows all the technological marketing avenues in today world), dedicated and knowledgeable. You will be happy! We would hire Shaw over and above anyone in the industry. We wanted a sales team, and we got one. Whether buying or selling again, Shaw would be my first call. Thanks again Shaw to you and your team for all the help! Initially when I started looking for a home I did all the research myself and thought I could handle it. However , with the way today’s housing market is I needed help and called Matt for his services and I am so glad I did. He got things done very quickly and helped get me a house that I wanted within 2 days. I highly recommend Matt as he bent over backward for everything that I requested. Thanks again Matt for all your hard work, it is greatly appreciated. A progressive Realty group of hard working professionals! I was so impressed with my agent and his team, I recommend them highly. Caring and intuitive people I trust implicitly. Matt is the most dedicated professional realtor we have ever had. We had to move in a hurry over 2 years ago and he was able to show us all the houses that we were looking for. He did all his research and was up to date with everything. He went over and beyond to help us in any way he could. He was helpful, patient, and not the pushy salesman type. A great asset to the realty profession! Matt helped my girlfriend and I find an awesome first home. Highly recommend him if you’re looking for education and great service. Much appreciated!! When I need to sale my house Shaw reality was great! They were friendly, positive and up front! They sold my place faster then I thought it would go! Matt Guthrie and his team are the best in the Niagara region! Matt is professional, smart and friendly. He made himself always available throughout our buying and selling process. Not to mention he sold our house OVER asking price and for the house we moved into got us in UNDER asking price. Would easily recommended him to any friend or family member with the peace of mind that they will be in good hands. Zac was professional, friendly, knowledgeable and answered all of our questions. His plan for selling our childhood home was bang on and it sold within 24 hours over asking price. I would highly recommend Zac and his team. Matt Guthrie is the man,professionalism ,helpfull,we got our our house the time of the battle of the bidders last Feb-April 2017 ,Matt make the best and fastest way to escapes from the battle ,.very satisfying service.very recomendable. Zac was extremely professional throughout our whole purchase, he helped us out a lot when buying our first home. He offered us amazing advice and was always sure to be timely with his responses. He was always proactive when setting up showings and would schedule multiple in the same day to make it easier for us. I would recommend him to anyone looking to buy their first home, or their forever home. Matt and the whole team at the Shaw realty group are my go to people in the Niagara. From an industry professionals perspective there are few teams that have this level of expertise and dedication. Absolutely, would recommend Ryan in what ever your Real Estate needs are, selling or buying or both! Matt empowers his clients through education. He’s willing to tell people what they need to hear, in order to avoid issues later in the transaction. His team’s knowledge of the St. Catherines / Niagara region is unparalleled. Would highly recommend. Matt and his Team have been an asset for me in gaining knowledge into the St. Catherine Real Estate market. I can fully trust their expertise and knowledge to guide me through referring clients to their market centre. My husband and I purchased our first home with Matt’s Help and we couldn’t be happier. The amount of information that was provided to us as first time buyer’s was greatly appreciated. A pleasure to work with and “if” we ever sell we know who to call!! Definitely sending anyone who asks this way! My boyfriend and I were looking for our first home. Matt gave 100% into meeting our wish list and and price range. We are so thankful for everything he did for us. I would highly recommend Matt to anyone who is looking to sell or buy…. Thanks Matt for making our wish come true!! Fresh ideas, new approaches, a strong team and a great will to service his customers! It’s been great to be apart of Matts drive and success! Matt was superb!! Professional, thorough and got me a deal beyond my beliefs!! I highly recommend him to anyone buying or selling!!! Thanks again Matt!!! Matt and his team are awesome, hard working and dedicated. They work tirelessly to create great experiences for their clients. I would highly recommend Matt and his team to anyone. I used Matt to buy my new home, and sell my old one. Matt is knowledgable, patient, and is willing to accommodate to any hectic schedule. I purchased my new house with plans to renovate, and wanted to do so in comfort, living in my old home. Once the renovations were nearing completion, we listed my old house. Only two weeks after I had moved into my new house, Matt had my old one sold. It was a huge relief to not have to pay 2 mortgages at once for long. Good job and thank you! 5 star service hands down.